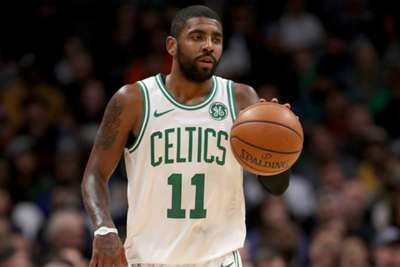 Kyrie Irving branded Jamal Murray's last-gasp three-point attempt as a "b******* move" after the Boston Celtics suffered a loss to the in-form Denver Nuggets. Despite 31 points from an impressive Irving, the Nuggets moved to 9-1 with a 115-107 home victory courtesy of an inspired Murray, who scored a career-high 48. That accomplishment was not without controversy, though, as Irving took exception to Murray attempting a deep three-pointer as time expired when the outcome of the match – a Nuggets win - was already certain. Irving caught the missed attempt, refused to shake hands with Nuggets assistant Jordi Fernandez and threw the ball into the crowd before storming off the court, going on to explain his dissatisfaction after the game. "The ball deserves to go in the crowd after a b******* move like that. So I threw it in the crowd," Irving said, per ESPN. "I mean, what kind of competitor wouldn't it bother? I understand if we fouled him, going to the free throw line. "I don't want to make a big deal out of it. Obviously, I was p***** at the game, but it's time to decompress and move on. Congratulations to him having 48 points. He did it in a great fashion against us. "Our defense has to be better, especially against a player like that in the pick-and-roll. He was the primary concern and he made us pay in certain instances of making some tough shots and some tough layups." Murray, who made five three-pointers, was apologetic after the match, insisting he had only wanted to reach 50 points, having missed a previous attempt to get to the milestone shortly before. "I think my emotions took over, as it normally does," the 21-year-old said. "No disrespect to the Boston organisation and fans with that shot - I just had in my mind that I was going to go 50, and I think everybody kind of understood that was what I was trying to do. "I really wasn't meaning no disrespect. I know half the team over there, so no hard feelings. "Everybody knew I was trying to go for 50 at that point. That was the problem. I didn't mean no disrespect. My emotions just took over... I just lose myself sometimes." The Celtics' second straight defeat left them at 6-4 for the young season, with a road game against the Phoenix Suns up next on Thursday.